SOLD! HK XM-8 TBT8 SL8 Conversion kit $1375 ONE LEFT! I am offering the long awaited Tommy Built Tactical TBT8 furniture package. 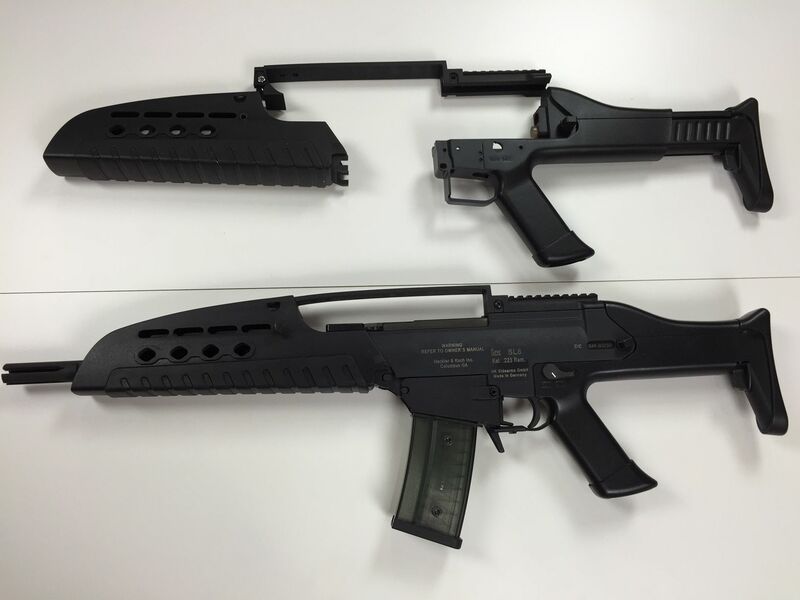 This kit was developed around the Hk XM8 rifle that never went into production. Easily turn your SL8-1 or SL8-6 into a XM8 clone! Only basic mechanical skills are required. The kit consists of an XM8 style mid length handguard, lower with grip, adjustable Stock and carry handle optics rail. This kit is designed with virtually no modifications needed to install and will count as 4 of the 5 required 922R compliance parts. If you prefer the double stack magazine capability (G36 magazine), you can send the kit and rifle to Tom Bostic for him to modify the magazine well. The kit comes in Black, but can be easily finished in Duracoat or Cerakote in a color of your choice by yourself or your assembler. PRICE: $1,375.00 includes USPS Priority Mail shipping with tracking within the Continental US. LAST ONE SO DON'T MISS OUT ON THIS OPPORTUNITY TO UPGRADE YOUR SL8 RIFLE. IN STOCK AND READY TO SHIP! Tom Bostic spared no expense in the manufacturing of these kits. PAYMENT: USPS Money Order, recognized Bank Cashier’s Check or you may use a major (Discover, Master Card or Visa) for a 3% surcharge. SHIPPING: USPS Priority Mail with tracking. This kit can be shipped directly to you, since an FFL is not required. Please contact me at Bob@firearmsdepot.us for further details or to place your order. Check me out at: https://www.facebook.com/FirearmsDepot and thank you for your interest. One kit left and don't have any plans at this time to have more fabricated.